BEST OF THE WEST - BELGIAN CONTEST SERIES 2010 - SECOND STOP IN BRUGGE/ BELGIUM! Check out the Game Of Skate and the Best Trick Jam. 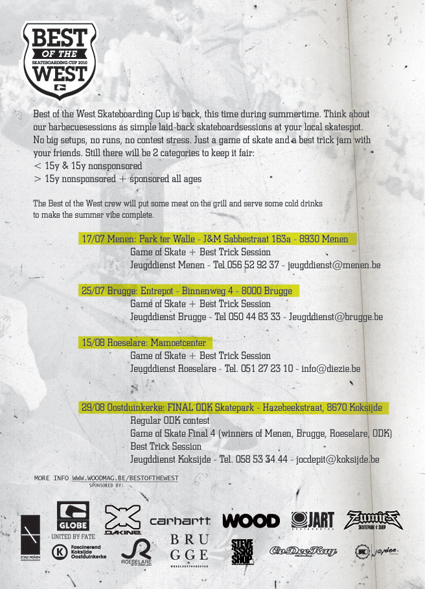 The next and last stop before the finals will be in Roeselare/ Belgium on the 15th of August 2010! "IN SEARCH OF THE MIRACULOUS" PREMIERE IN LYON/ FRANCE 23.07.2010!